I think we can all agree that book clubs are great. They encourage a sense of community and collaboration as the group reads and discusses their reactions to the texts. They foster students’ sense of agency as they choose titles of interest, rather than forcing them to read required curricular titles. They make reading into a social event, helping students engage with peers in a way they might not otherwise. But book clubs can also come with some difficulties for the creators and organizers of the clubs–which is often us, the school librarians and teachers. Fortunately, there are a growing number of digital solutions to the analog problems created by book clubs. 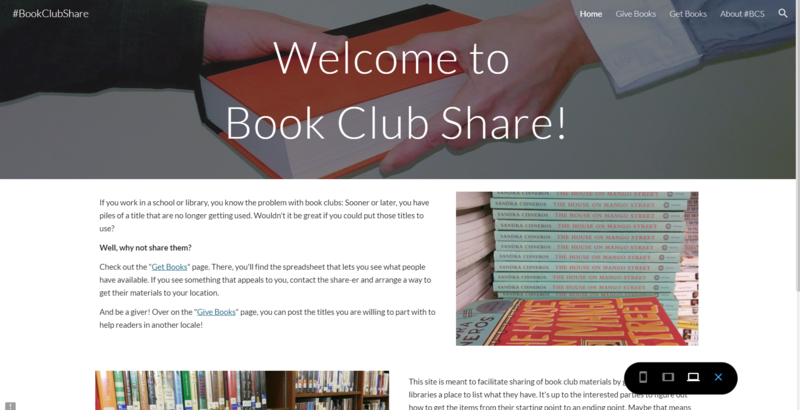 BookClubShare.com is a free site I created to help schools and libraries share their book club materials. 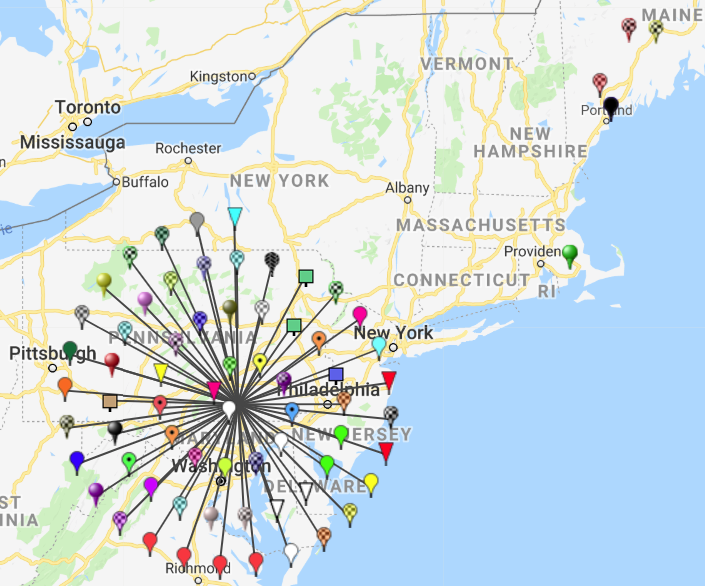 The idea for the site came from discussions during an Edcamp unconference held by the New Jersey Association of School Librarians (NJASL). But it wouldn’t have been born without the encouragement of Dr. Joyce Valenza, who is not only a great professor, but who also suggested the name. “Givers” post information about titles they have but are looking to pass on to another good home. 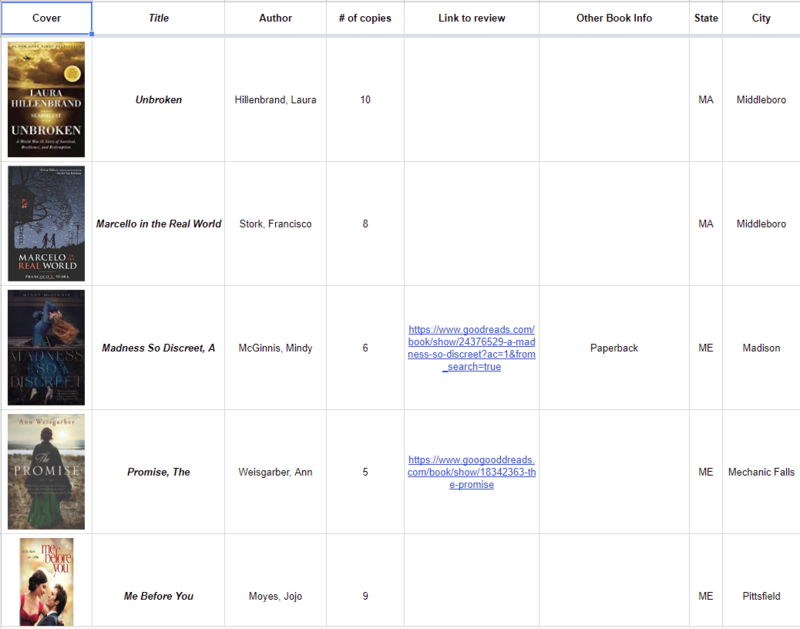 Once they submit the book info and a bit about their location, their entry becomes visible on the “Get Books” page. Users can browse the “Get Books” page to see available titles. Titles are arranged alphabetically by state/location. They can be sorted by categories like title, author, and number of copies available. The book information is supplemented with a map that shows locations that have books to give, along with the titles available from that location. If someone sees a set of book club materials they’re interested in, they can contact the original poster via email to arrange to get the materials. Available titles are sorted (by default) by location; but can be sorted by title, author, etc. Pins on the map show where materials are located; clicking a pin shows what titles are available at that location. The main idea of the site is that all too often, we end up with a collection of book club materials that are just taking up space. BookClubShare.com gives school librarians a chance to help those materials find new homes. This can be a godsend for those who are seeking materials on limited budgets, as they might be able to find a treasure trove of materials a few towns over that are just waiting to be picked up. And it can provide a good alternative to tossing out perfectly serviceable materials when it’s time to clear out those overfilled storage rooms. This is the kind of site that only works if plenty of folks take advantage of it, so spread the word! The more folks that use the site, the greater the chance that you’ll find that set of materials you didn’t know you were looking for! Sometimes the hardest part about getting a book club going is finding a time and place for all the members to gather. There are lots of asynchronous solutions, but many of them involve social media that can cause issues with school Internet filters. But GroupMe just might offer a solution to these woes. GroupMe is a free group messaging and chat service, but it can also function as a great book club tool. It allows you to create and administer an online book club that students can quickly access on mobile devices; and joining a group is easy with QR codes, which GroupMe generates for you. It’s a fast, effective way to get students into a monitored chat environment where they can talk about the book club titles! Here’s a quick slideshow I made that walks you through the set-up process. I came up with the idea for using GroupMe after reading a post on LM_NET. A librarian was seeking ideas for how she might create an online or virtual book club space for students at her school. She mentioned that the school had used Remind101, the texting communications app, to communicate with students, but that it wasn’t going to be helpful to them for this project, as students couldn’t respond back in a way that worked for them. This immediately made me think of my experiences on a recent school field trip. The chaperones needed to stay in touch, and Remind wasn’t cutting it, so one of the teacher-chaperones suggested GroupMe, and it was perfect. Reading that LM_NET post, I was brought back to that moment, and a quick once-over convinced me GroupMe could make a great virtual book club for students. In thinking about both of these digital tools, I realized that they do a great job of encapsulating what book clubs are all about–working together, sharing ideas, helping each other to gain a greater understanding of what’s in front of us. And both of these experiences are what being an educator is all about–flipping through all our knowledge and experiences and finding ways to help others by sharing what we know. So share the above tools with anyone you think might benefit from them. And share your thoughts for other great tools and techniques! Thank you for this! It couldn’t have come at a better time. I am in the midst of trying to organize/plan my first Book Club discussion of the year and am feeling that this traditional route is no longer working/applicable. With competing activities and scheduling conflicts, my students’ exuberance in the book club has waned considerably over the last few years. I was just telling my coworker it might time to retire the book club, but this article gives me new ideas.